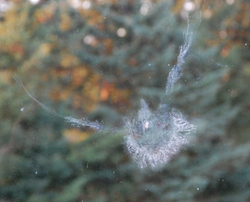 imprint after a window collision. We would like to share some great resources with you related to making buildings and even your own home safer for birds. Audubon Minnesota has some great information in their Project BirdSafe section, which is a joint effort to reduce the number of birds killed or injured when they collide with structures such as buildings. Here are some links that talk about why collisions happen and what you can do. The Lights Out project talks about how most birds migrate at night and can be drawn off course by tall, lighted structures in their flight path. Many birds are killed or injured in collisions with buildings or drop from exhaustion after circling them, reluctant to fly out of the light. Lights Out programs can dramatically reduce these collisions. The Minnesota Lights Out program has been ongoing since 2007. It is supported by both Building Owners and Manager’s Associations (Minneapolis and St. Paul) and by the individual building staff that makes it happen every spring and fall.